Earn Certification Allowing You to Dive Anywhere in the World! Get your professional scuba certification. If you’ve always wanted to learn how to scuba dive, discover new adventures or simply see the wondrous world beneath the waves, this is where it starts. The Open Water Diver course is the world’s most popular scuba course, and has introduced millions of people to the adventurous diving lifestyle. Get Certified with US. Our 3-Day Course is perfect for travelers who want to vacation and get certified in Key West. (First day class work, then second and third day morning pool session and afternoon boat dives) Boat dives are done from our state of the art, modern custom built dive boat. What is an Open Water Certification? An open water certification course allows students to complete all classroom and pool work with a local dive shop. The local dive shop will issue students a certification letter. What is included in the Regular Certification Course? The regular open water certification course includes classroom, pool work, the four open water check out dives needed to complete your certification. What is included in the E-learning Certification Course? 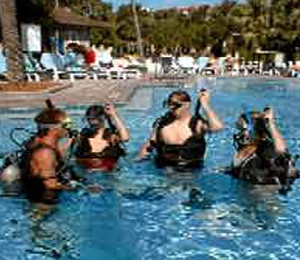 Pool training and open water dives with equipment are included. Academics will need to be arranged by yourself for the online classwork and is paid for separately. Is all equipment included in the cost of the course? All of your diving equipment is included in the price of the dive. Price does not include course books, logbooks, and dive card processing (extra fees - "Regular Certification" coursebooks are $79.95 plus $30 for cert card processing. "E-learning Certification" coursebooks are $48.95 plus $30 for the cert card processing) These are paid upon check in at the shop. Cost of online E-learning course via padi.com is additional and not included in the E-learning course. I have been to the Bahamas many times, but Open Water Scuba Diving Certification is one of my favorite trips! It includes everything that everyone should do here. As a Bahamas veteran, I can say only the best about this experience!